Before I get ahead of myself, Happy Easter to everybody out there! We’ve had a quiet one this year and it’s been lovely to have the time off with my family and not have to rush off somewhere, or stress about deadlines, etc. The boys finished their first term on Thursday and a few weeks ago, I saw these great Easter ideas in a craft/DIY email that I receive regularly from The Whoot. I generally bookmark anything that appeals to me or might be great for the boys and their friends or for ideas for gifts for friends etc so these were right up my alley! The original email entails baking your own cookies using refrigerated dough. You can roll it, cut the sizes you need and bake. I couldn’t find anything like it at the local Woolworths and the baking aisle was severely limited in terms of cookie sprinkles and decorations. I made do with Marie biscuits for the body and mini-packs of alphabet biccies for the feet. Large and mini M&M’s worked for the footpads and mini marshmallows for the tails. You may need to scout your local shop to see what they have that would work. I used ready-made Vanilla frosting only as one of Jason’s school friends was allergic to coloured frosting (you could use whatever colour works for you or make your own). Frost the bigger biscuit then two smaller ones for the feet. Gently push the feet onto the body – frosting side up. Add the marshmallow in between the feet for the tail and the M&M’s on the feet for the footpads. If the completed bunny bum seems a bit unstable, don’t worry too much. I found that once I’d put them in the fridge overnight (I was only taking them to school the next morning), that the frosting had set by the next day. Eat or give away with pride! I got some pink socks at the $2 store. I was hoping to find some pretty patterned ones, but alas, plain pink would have to do. Black fine point permanent marker, pink/red pencil crayon (for the blush) and some stuffing. I had plenty thanks to a Staffy who chews anything plushy or rubbery she can sink her teeth into. All the pink bits you see in the pic was one sock. Even the little bows were teeny offcuts I used. I had white socks in my craft box (left over from sock snowmen I made two Christmases ago). I did a test “face” on a white sock off-cut before I drew the eyes and mouth on the finished bunny. Cut the white sock, leaving the toe end intact. I cut a size of about 10cm, but you could cut a bigger size if you preferred. To make the head, work on about a third of the length (opposite end, naturally) and tie off or sew around tightly to make the head. The pink (or patterned) sock should be cut long enough to have the cuff (edge of the top of the pink sock) at the top as the bottom for the bunny’s jumper, with enough at the top to roll over. Put the jumper on the bunny, cuff-side down and roll the top down under the “neck”. I folded over and stitched the back of it to tighten the collar a bit. 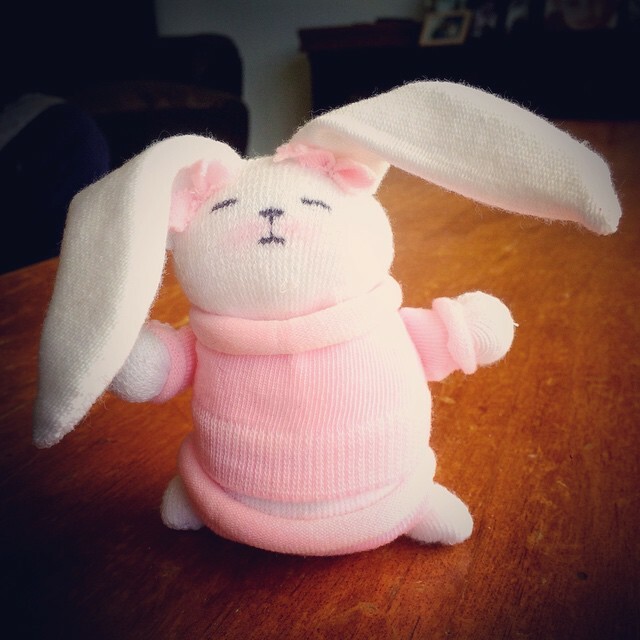 The pantaloons – I cut about 5cm of pink sock (just before the heel bit), put it on the bunny and then rolled the top down, so the belly showed. Once I had it where I wanted it, I sewed up the bottom to make pants. I cut two longish strips from the white sock (about 7 cm by about 2cm wide) and sewed the sides up, leaving the bottom open. I turned it inside-out (so pick which side you’d like on the outside before sewing!!) and then sewed the bottom bit up. Attach by sewing it to the head. Paint on the eyes, nose and mouth with black marker. The blush I added by cutting some pink pencil crayon with a craft blade onto some paper, then using a semi-wet brush to paint it on across the nose. Add the bows – I used the heel bit of the pink sock that was left over and cut a strip about 1cm long. Squished it in the middle to look like a bow and sewed that onto each ear. Yep. It was a bit finicky with my clumsy fingers! I hope this is helpful – like I said, it wasn’t meant to be a full step-by-step tutorial complete with pictures, etc, but hopefully, with the website links and my English version, you’ll have gorgeous bunnies in no time!! Please comment with links to your completed bunnies – I’d love to see them!